Winners of the FINTECH Accelerator Program! 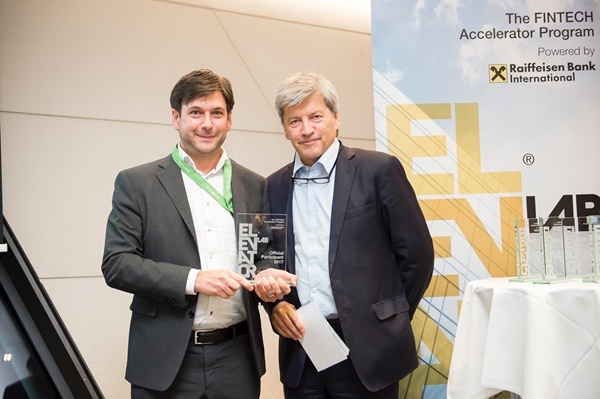 Four months ago, along with 336 other FinTech companies from 56 different countries, kompany entered into the Raiffeisen Bank International (RBI) Elevator Lab Acceleration Challenge. RBI’s aim for the program was to find extraordinary FinTech start up’s and support their development in the most efficient way. kompany was proudly selected by RBI to reach the second stage of the program and, after an online pitch by our CEO, Russell Perry, was named one of the top 15 finalists. After joining a 3-day development program culminating into a live pitch to senior industry leaders and members of the RBI advisory board, kompany was chosen along with 5 other start-ups for the opportunity to collaborate with RBI to increase their internal efficiencies (also see the RBI press release here). Don’t forget to stay in good kompany! © 360kompany AG – Gußhausstraße 15/5, 1040 Vienna, Austria – Commercial Court Vienna FN 375714x. All rights reserved.